Silently Tarneverro climbed into the little two-seater. Charlie started the car. "This is a terrible thing," the fortune-teller said. "Poor Shelah--I can scarcely realize it." Charlie shrugged. "Time to be philosophical," he suggested. "You have perhaps heard old Eastern saying. 'Death is the black camel that kneels unbid at every gate.' Sooner or later--does it matter which?" "I know, I know," Tarneverro continued. "But, in a way, I'm afraid I'm responsible for this. Oh, lord, the more I think about it, the clearer it becomes. Poor Shelah's blood is on my head." In The Black Camel (1929), the fourth Charlie Chan novel by Earl Derr Biggers, Charlie is again back home in Honolulu. Biggers is at his usual high standards of maintaining an elaborate murder mystery plot with plausible suspects. A group of actors, returning by ocean liner to Hollywood from filming in Tahiti, stop over in Honolulu. Famous actress Shelah Fane is seeing wealthy Alan Jaynes, who wants to marry her. But Shelah wants to consult her resident psychic Tarnaverro, who advises her against it. 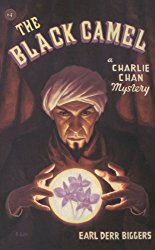 When Shelah is discovered murdered, Charlie Chan is brought in to investigate the crime. Bela Lugosi played Tarnaverro in the film. Biggers himself wrote the screenplay for the movie version. It was the only Chan movie for which he wrote the screenplay, and critics and reviewers have said it is the best Charlie Chan film ever made. It is a faithful adaptation of the book, and one which I, personally, enjoy immensely (as I do the novel itself). Tarneverro bowed from the hotel steps, and as the car drove off Shelah was conscious of Julie's frank young eyes fixed on her with a disapproval that was almost contempt. The head bell-man touched Tarneverro's sleeve. "Excuse. There is a man who waits to see you. This one." The fortune-teller turned to perceive a bulky Chinese who approached him with an amazingly light step. The ivory face was wearing a somewhat stupid expression; the black eyes were veiled and sleepy-looking. Not a very intelligent Chinese, Tarneverro thought, wondering vaguely what this visit presaged. The oriental placed one hand on his broad chest, and achieved a grand bow despite his waist-line. "A thousand pardons," he remarked. "Have I the undisputable honor to address Tarneverro the Great?" "I am Tarneverro," answered the other bruskly. "What can I do for you?" "Permit that I introduce myself," continued the Chinese, "unworthy of your notice though I am. The name is Harry Wing, and I am humble business man of this island. Do I extend my remarks too far when I say I wish to see you alone?" "The matter is of pressing urgency. If I might suggest--your room--"
The fortune-teller gazed for a moment into that placid mask of a face, behind which life seemed nonexistent. He capitulated. "Come along," he said. Obtaining his key at the desk, he led the way. Once inside the door of number nineteen, he turned to confront his odd visitor, who had followed on noiseless feet. The curtains of the sitting-room were drawn back as far as they would go, and the place was flooded with light. With his customary forethought, Tarneverro had selected an apartment on the mountain side of the hotel, and a restless cool wind from the Koolau Range swept in at the window and stirred the papers lying on a desk. The countenance of the Chinese was still without expression, even under the piercing scrutiny the fortune-teller now gave it. "You are the famous Tarneverro," began Harry Wing in a respectful singsong. "Among Hollywood people you have vast reputation as one who lifts dark veils and peers into uncertain future. Black as lacquer that future may be to ordinary eyes, but to yours, they say, it is clear as glass. Permit me to add this reputation pursues you even to Hawaii, dogging like shadow at your heels. The rumor of your mystic skill floods the street." "Yes?" put in Tarneverro shortly. "What of it?" "I am, as I say, business man of small importance to everybody but myself. Now I begin to speak to you frankly that opportunity arouses itself in my path. I can amalgamate my business up together with that of my cousin from a north province. Future looks bright, but qualms assail me. Will the merge have success? Is my cousin honorable as cousin of mine should naturally be? Can I trust him? In fewer words, I desire dark veil lifted, and you are man to do the business. I stand ready to make generous payment for this lifting." Tarneverro's eyes narrowed, and for a long time he stood staring at this unexpected customer for his wares. The Chinese waited motionless as a Buddha, with his hands in his trousers pockets, his coat thrown back. The fortune-teller's glance rested for a moment at a point just below the fountain-pen pocket on his visitor's waistcoat. "Impossible," he said, with sudden decision. "I am here on a vacation, not to practice my profession." "But rumor remarks," objected the other, "that you have already done work with crystal--"
"For one or two of the hotel managers--as a friendly gesture," Tarneverro cut in. "I received no fee of any sort. I will not do this kind of thing for the general public." Harry Wing shrugged. "The matter then becomes sad disappointment for me," he answered. A grim smile spread over the seer's dark face. "Sit down," he said. "I have spent some time in China, and I understand how great is the interest of your people in fortune-tellers. So for a moment, while you were telling me why you came, I thought you were speaking the truth." The visitor frowned. "I am now rapidly failing to understand you." Still smiling, Tarneverro dropped into a chair facing the oriental. "Yes, Mr.--ah--er--Wing, I believe you said--momentarily I was deceived. And then a certain little gift of mine came to my aid. You have been kind enough to speak of my success. I have succeeded--why? Because I happen to be psychic, Mr. Wing--"
"Chinese people are psychic, too." "Just a moment. As I stood there listening to you, a psychic wave swept over me. I had a feeling--a feeling of--what? Of stern men who sit in police stations and are sworn to enforce the laws. Of detectives pursuing evildoers, landing them at last--and then, a court of justice, so-called, a learned judge. That, my friend, is the feeling I had. Rather amazing, don't you think?" His visitor's expression had lost suddenly all its stupidity. The little black eyes snapped with admiration. "Amazing smart act on your part, yes. But as for me, I do not think it was psychic feeling. A moment ago I beheld your eyes resting with fierce understanding on locality of my own waistcoat from which detective badge was recently removed. The pin has left indelible marks. You are number one detective yourself, and I congratulate you." Tarneverro threw back his head and laughed. "Touche!" he cried. "So you are a detective, Mr.--er--"
"The name is Chan," said the bulky Chinese, grinning broadly. "Inspector Chan, of the Honolulu police--former times Sergeant, but there has been upheaval in local police department, and I am rewarded far beyond my humble merits. Trap which has just failed so flatly, I add in justice to me personally, was not my idea. I informed Chief it would not work unless you happened to be extreme dull-wit. Since you turn out clever beyond expectation, it did not. No bitter feelings. I pause only to call attention to local ordinance which says men like you must not practice dark arts in this town without obtaining permission. A word being spoken to the wise, I rise to accomplish my exit." Tarneverro also stood up. "I am not going to practice among your townspeople," he announced. He had dropped the tense air of mystery which he evoked for the benefit of film stars, and seemed quite human and not unlikable. "It has been a pleasure to meet you, Inspector. As for my own detective prowess, I may say in confidence that it is rather useful in my work." "Must be so," returned Chan. "But such skill as yours should be at service of public. Frequently in Los Angeles murder mystery leaps into print and never gets solved. I study them all with fiery interest. The Taylor case--what an amazing happening was there--haie, it is still mystery. And case of Denny Mayo, famous actor of handsome countenance, dead in his home at night. How many years--three and more--and Denny Mayo is still unavenged by Los Angeles police." "And never will be," added the fortune-teller. "No, Inspector, that is not in my line. I find it safer to dwell on the future and soft-pedal Hollywood's past." "In such course, wisdom may abide," agreed Chan. "None the less, how happily I would welcome your aid if some such worrisome puzzle stared into my face. I will say good-by, Mr. Tarneverro. Memory of your cleverness will linger in my poor mind for long time to come." He slipped quietly out, and Tarneverro glanced at his watch. For more information about Charlie Chan, click on the links below to read articles.